The sites in Amble for up to 500 homes (blue), up to 166 houses (red) and up to 272 (green). More than 900 homes across three developments in Amble have been given the go-ahead for the second time by councillors. The schemes were back because Northumberland County Council has taken the decision that where planning applications have been approved but the permissions not finally signed off, they should be reassessed in light of the Government’s updated planning rulebook, published in July. In this case, council officers still recommended the three outline bids in the town for approval and all three were unanimously backed at Tuesday (December 4) night’s meeting of the strategic planning committee. The proposals in question were for up to 500 homes on land to the south and south-east of James Calvert Spence College (JCSC), off Acklington Road; up to 272 homes on land north-east of Amble Sewage Treatment Works, off Percy Drive; and up to 166 homes west of the A1068, to be known as Hauxley View, which were first approved in September, October and November last year respectively. However, in relation to the neighbouring sites of the Hauxley View and JCSC bids, there was one change for committee members to consider. During the discussion on these applications last year, a condition to enable the creation of a link road between the A1068 and Acklington was imposed by the councillors. However, planning officers now recommended that this was dropped following further work on this proposal, given that it is not required to make the developments acceptable on highways grounds and the prohibitive seven-figure cost would have to come from the money being allocated for the likes of affordable homes, education and healthcare. Nonetheless, the developers of the Acklington Road site, Hindhaugh Homes, has agreed to upgrade the access junction so that it is capable of taking a link road in the future. Coun Jeff Watson, ward member for Amble West with Warkworth, said: “The link-road condition was always one we wanted rather than one which could be forcibly applied. I’m encouraged by the attitude of the developers in trying to assist with this so I’m positive. “We have got a huge amount of money for Amble and the applications tonight will result in £4million for ecology, sport, health and education. 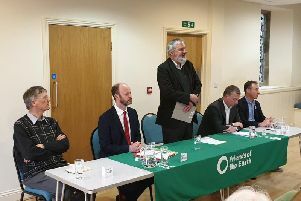 The meeting also heard from objector Joy Hope, representing the group Love Amble, who raised concerns about the ecological impacts and the insufficient mitigation to counteract them. However, David Feige, the council’s ecologist, said that the issues raised were exactly what the authority’s new coastal mitigation scheme, which seeks contributions from developers to fund a wardening programme, was designed to tackle. In relation to criticism that the measures were not specific to Amble, he said that this was because people do not solely use the coast in one place; residents of the new homes will obviously do so in Amble but will also go to other places, such as Druridge Bay.